While baby has arrived, I've got a few more pregnancy outfits scheduled to share on the blog, as I enjoy the newborn cuddles and try to avoid going out too often as we adjust to life with two under 2! Two casual denim shorts outfits with my Balenciaga tempete day bag. Hard to believe it's almost 7 years old! This is why I like to splurge on accessories. They last a long time and unlike clothes, always fit - even during pregnancy. When I was trying to think of different outfit combinations with my limited third trimester capsule wardrobe, I was having a look back through past blog photos and was surprised I hadn't worn this tank and kimono together before! I really like the pairing, glad I gave it a go. Wore this for a day out in Brisbane with my mum and toddler T, we went to the baby and toddler expo and got a lot of great things. In the evening, we had dinner at the in-laws. I'd usually change and try get a little dressed up for dinner, but felt happy and comfortable in this so just wore the same thing in the evening. Last worn: Ray-Ban Wayfarer, Somedays Lovin' kimono, green maternity tank, boyfriend denim shorts, Havaianas, Balenciaga tempte day bag. Other ways to wear: printed kimono and a maxi skirt, green maternity tank with gold accessories, boyfriend denim shorts and a novelty pregnancy tee, Balenciaga tempte day bag and a blue dress. This is an outfit combination I've worn before, the singlet and shorts together. Different accessories this time though, to try change it up just a little. It was another hot and humid day - despite it being autumn Brisbane hasn't turned down the summer temperatures yet! Just wanted something simple and easy for taking toddler T to playgroup. Really liked the monochrome look of this outfit with the blue Balenciaga bag and the blue singlet and shorts. Last worn: printed maternity singlet, maternity bermuda denim shorts, Havaianas (above), Balenciaga temptete day bag (above). Other ways to wear: blue printed singlet and a red bag, bermuda denim shorts and a striped tank, blue Balenciaga day bag with pink and purple. Linking up with What I Wore, Fresh Fashion, Oh Hey Girl, Style Perspectives, Fashion Files, A Labour of Life, Fun Fashion, Weekend Wear. Two under 2? How old is your elder one? I love your kimono! So pretty! First off, congrats on the arrival of your newest family member. Two under two is intense but they will grow to be super friends. Secondly, WOW! I did not look like this in my third trimester. I remember feeling exhausted with my wardrobe and wearing a lot of oversized t-shirts from my husbands closet. You look adorable and stylish! Thanks, I think having a capsule wardrobe helped with getting dressed everyday! :) Sadly none of hubby's shirts would fit me anyway, ha! I just love the color of that bag! And it's so true, bags (and sometimes shoes) are always a great investment because of their longevity! 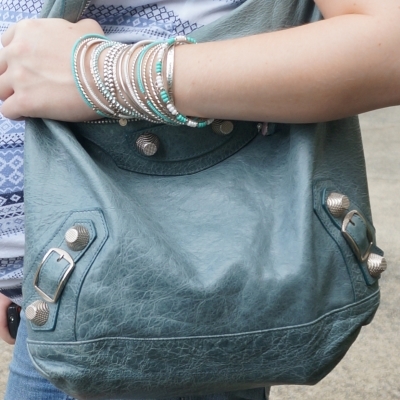 You are rocking some amazing arm candy in these outfits! Wow! Also, I say wear to dinner whatever you're comfortable in. Especially if it's this cute! Very true! Comfort is the most important thing! you have the cutest kimono tops! love the balenciaga! You look great in denim and I am loving your blue bag. Dear I'm so glad to know that your baby has arrived and that everything is okay, I'm truly happy for you and your lovely family. Your pegnancy style has been impeccable, especially taking into account that your third trimester was in the middle of summertime. Quite a challenge! But you always nailed it to perfection. My best wishes to you and your family in this new chapter of your lives. Such a cute outfit - love your kimono! Thanks for linking up with Style Perspectives today! I love how you've made all your outfits look fresh even though you're using a lot of the same pieces--pregnancy sure forces you to be a good remixer. I think you've totally nailed it though! OMG a massive congratulations! Enjoy those newborn cuddles! Love those shades of blue in your second look! Great summer outfits...make me long for warmer temps over here. Mica I applaud you for being so creative during your pregnancy. You looked radiantly amazing the whole time and I'm sure your outfits inspired many other women who needed ideas on how to stay cool and look great during pregnancy. Congratulations on your new arrival. Love that bag! Have a beautiful day! Congrats on baby! And congrats on another amazing pregnancy wardrobe and style. I love that aqua tank on you. Really loving that kimono in your first look... I can't believe your pregnancy style over the last several months... you rocked it girl!! Congrats on your new baby!! Enjoy those newborn cuddles with your sweet bundle! Oh good luck with that! We are wondering when to transition toddler T as a few times he's attempted to climb out. But dealing with a newborn is not the best time, ha! You are so cute in aqua, lady! First, congratulations on welcoming the newest addition to your family! It's been such a pleasure seeing your fashion journey while pregnant and I look forward to your posts in the futures. That said, I love the way you've styled your Balanciaga bag with these two lovely outfits, Mica! Thanks so much for sharing and I hope you're having a wonderful week so far! I love your casual yet chic outfits, you look gorgeous in both of these outfits. Congratulations! It’s good you have a few more outfits scheduled so you can have some time off with your new one. Love the Yakuza kimono. Perfect for the weather we’re having now - though I think it’s probably a bit hotter where you are haha. It is still so hot here in Brisbane! Aircon is still needed! So much for autumn, haha! Congratulations on the new addition to your family! I love the color of that bag! Both of these looks are so cute! Congrats Mica! I hope you are doing well.. I love this bright top & cardi in the first outfit..Looking good.. I would love for you to enter this outfit and any latest looks on my new linkup, currently live. Thank you and Happy April! You have the BEST bags! Looking oh so pretty, Mica! Thanks so much for sharing with Fun Fashion Friday!